A premium Android-powered smartphone, the Samsung Epic 4G Touch for Sprint has been designed to deliver the best multilayered entertainment experience thanks to its superior speed and display innovation. Powered by one of the fastest processors on the market--the new 1.2 GHz dual-core Samsung Exynos, the Epic 4G Touch runs on Sprint's ultra-fast 4G network (as well as 3G networks where 4G isn't available yet) for lighting quick access to movie downloads, games, and thousands of applications--all without buffering or lag time. Enjoy on-the-go entertainment with the large 4.52-inch touchscreen and unrivaled Super AMOLED Plus technology offering deeper, richer color for a bright and vivid display. The Epic 4G Touch also includes an 8-megapixel camera/camcorder with auto-focus and flash that shoots video with incredible detail in full HD 1080p resolution, plus a 2-megapixel front-facing camera that's perfect for self-portraits or video chat. It runs on Sprint's expanding 4G network, offering simultaneous voice and data connectivity and download speeds up to 10 times faster than 3G. Additionally, the phone can still connect to 3G data services in areas not currently served by Sprint's 4G network (learn more about Sprint's 4G network below). The phone also includes Wireless-N Wi-Fi networking plus Mobile Hotspot capability for sharing your 3G/4G connection with up to eight Wi-Fi enabled devices simultaneously. Other features include a 16 GB internal memory (with expansion up to 32 GB via optional microSD cards), Bluetooth for hands-free devices and stereo music streaming, GPS for navigation via built-in Google Maps and location-based services (plus access to the optional Sprint Navigation turn-by-turn service), personal and corporate e-mail, and up to 6 hours of talk time (see full specifications below). Despite being one of the thinnest smartphones on the market--measuring just 0.38 inches thin-- the Epic 4G Touch is packed with a bevy of Samsung technological innovations and exclusive features. The 4.52-inch Super AMOLED Plus display has a 50 percent higher pixel density, resulting in excellent textual clarity and even better graphics. The Super AMOLED Plus display is also razor thin, helping to reduce the overall size of the Epic 4G Touch, and it also helps to reduce power consumption by 18 percent. Samsung's TouchWiz user interface provides superior multitasking and customization for an enhanced visual and intuitive smartphone experience. Features include direct access to music player's controls and to missed events, calls, and messages from the lock screen. The 1.2 GHz dual-core Samsung Exynos processor includes five graphics cores (compared to just one in many of today's dual-core mobile processors), which helps both multitasking and Internet browsing as well as smooth Full HD 1080p video rendering. Samsung's Media Hub enables you to rent or purchase movies and TV shows within seconds watch from the convenience of anywhere. With Media Hub's progressive downloading feature, you can start watching your content almost immediately as the rest of the file downloads to the Infuse 4G. Plus, all Media Hub content can be shared among five Media Hub-enabled devices on the same account. Cisco AnyConnect Virtual Private Network (VPN) for reliable, easy-to-deploy encrypted network connectivity. Cisco WebEx Meetings allows you to meet anywhere at anytime in a secure environment. View documents and applications, plus share screens with live annotations. You can also choose to chat privately or with everyone in the meeting. Sybase Afaria mobile device management, which provides over-the-air deployment of software as well as remote device wipe should it become lost. 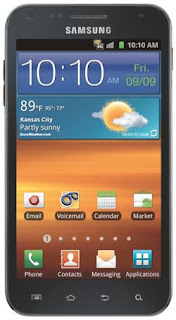 The Samsung Epic 4G Touch weighs 4.55 ounces and measures 5.1 x 2.7 x 0.38 inches. Its 1800 mAh lithium-ion battery is rated at up to 8.7 hours of talk time. 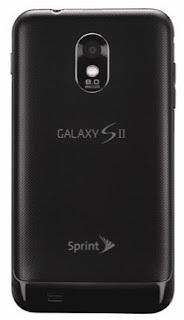 It runs on Sprint's 4G network as well as the 800/1900 CDMA/EV-DO Rev. A frequencies. The Epic 4G Touch runs the Android 2.3 operating system (dubbed Gingerbread)--the fastest version of Android available for smartphones yet. It features a cleaner, more refined interface with new icons, improved top notification bar, and more intuitive navigation. Multitasking in Gingerbread allows you the ability to run more than one app at a time. If you're playing a game, you can easily switch to an incoming email and then switch back to the game without losing your place. And like the previous version of Android ("Froyo"), Gingerbread provides support for Adobe Flash Player 10.1 for access to the full Web. The Epic 4G Touch also brings one-touch access to the popular Google mobile services you use every day, including Google Search, Gmail, Google Maps with Navigation, Google Calendar, Picasa, and YouTube. It also provides easy access to both personal and corporate e-mail, calendars, and contacts supported by Exchange Server and Gmail. And through Android Market, you'll get access to thousands of useful applications, widgets, and fun games to download and install on your phone, with many more apps being added every day. Sprint 4G offers a faster wireless experience than any other U.S. national wireless carrier, and Sprint is the only national carrier offering wireless 4G service in 32 markets (with more coming online soon). Sprint 4G delivers download speeds up to 10 times faster than 3G, giving this mobile phone the fastest data speeds of any U.S. wireless device available today. As of August 2011, Sprint offers 4G service in 71 markets in 28 states. Built-in mobile hotspot functionality allows up to five Wi-Fi enabled devices to share the 3G or 4G experience on the go with a laptop, camera, music player, game unit, video player, or any other Wi-Fi enabled device. 8-megapixel rear camera with auto-focus and flash. 2-megapixel front-facing camera for self portraits and video chat. Vlingo Voice Talk allows you to give your Epic 4G Touch voice commands, including voice dial, text message, navigation, music, Web browsing and search. Task Manager enables you to view and close active applications and any items that have been downloaded, plus check on memory usage via the Task Manager widget. Samsung Social Hub allows you to transfer e-mail, instant messaging, contacts, calendar, and social network connections--including Twitter, Facebook and LinkedIn accounts--into Feeds and Messages folders that can be either put into separate tabs or combined into comprehensive lists.